I was on a lemon kick a couple of nights ago. I made lemon greek grilled chicken, lemon roasted potatoes, and topped my broccoli with lemon pepper seasoning. It was a great meal! The potatoes were great! I happen to run across them on facebook and decided on a whim to make them and the chicken (recipe coming soon). 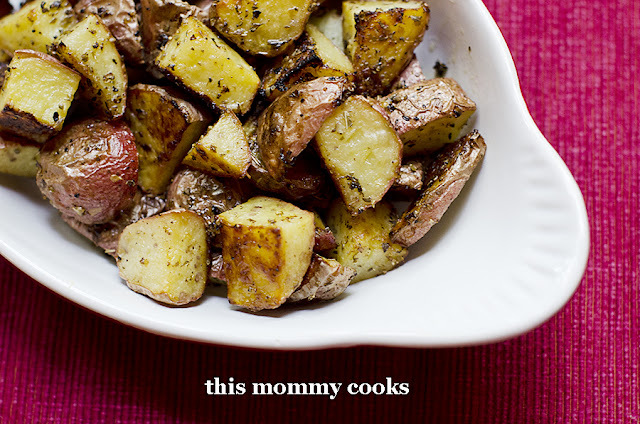 I love roasted potatoes, don't you? Scrub potatoes and cut into one inch chunks. Mix all ingredients in a bowl, toss in potatoes. Pour potatoes and sauce onto greased baking sheet, spreading them out in a single layer. Bake for 45 minutes to 1 hour, flipping the potatoes half way through until they are golden brown. So glad the turned out great for you. We all love them in our house - love the lemon flavour! Wonderful picture!